ihaveinsurance.com is a website by Wells Fargo to verify whether customer requesting a home or auto loan has necessary insurance. Before you proceed with entering your information into the website make sure that you’re browsing legit ihaveinsurance.com website. Lots of phishing attacks start with mail and URLs which lead to malicious websites. 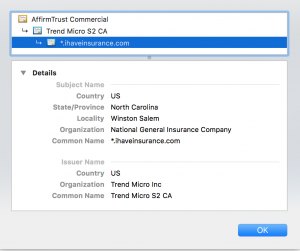 You can check out our Anti-phishing guide on how to quickly check SSL certificate for the ihaveinsurance.com and make sure that you’re accessing an official ihaveinsurance.com website. Below are details we got for ihaveinsurance.com SSL. If you have a reference number for an existing verification you can start by typing it in the form together with an access code and zip code. If you don’t have a reference number you can proceed with new verification by clicking on “I don’t have a reference number” link. On a next page, you will need to select the type of loan you’re applying to (home or auto) and provide your (or your customer) details. Once you finish filling the form, click continue to receive information whether insurance verification succeeded. If you don’t want to use the website above you can verify insurance by providing following details to Wells Fargo via mail or fax. 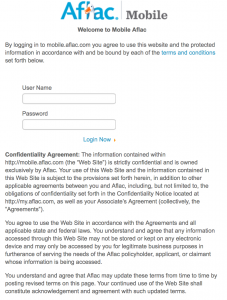 The text below is a short guide on how to access and login to Aflac mobile portal located at https://login.aflac.com. It is also accessible from myaflac.com and my.aflac.com domains all of which redirect to https://login.aflac.com. Aflac is the largest provider of supplemental insurance in the United States. It was founded in 1955 and has headquarters in Columbus, Georgia. Aflac is represented by 76,900 licensed sales associated in the United States and 19,3000 sales agencies in Japan. myaflac.com is used by Aflac clients to pay invoices and manage their account information online. 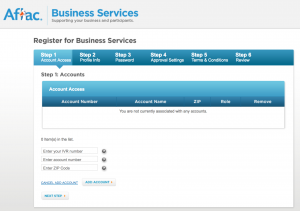 Navigate to https://my.aflac.com/uam/Register.aspx (Register for Aflac Business Services) page. For more detailed instructions on how my.aflac.com works refer to the following page at Aflac website https://www.aflac.com/business/resources/my-account/new-accounts.aspx.